The only person who should decide what exercise you do—if any at all—during your period is you. After all, each woman's menstruation experience is unique. Although some of the symptoms you can experience before or during your period might make exercise unpleasant, sometimes exercise can help alleviate that discomfort, too. Therefore, it pays to experiment and find what works best for your body. Although premenstrual syndrome is sometimes bandied about as a joking matter in pop culture, it's a real condition that's often at its worst during the several days leading up to your period and can linger for the first few days. Just a few of the symptoms that might affect your workout experience include sore breasts, headaches, bloating, tiredness, anxiety, a sense of sadness, pain and cramping. The ability of exercise to help is hardly a myth, and relief from cramping, painful periods — also known as dysmenorrhea — may be one of the biggest benefits of exercise during your period. A 2019 systematic review and meta-analysis published in the journal BMC Complementary and Alternative Medicine found that exercise showed the greatest benefit in reducing menstrual pain, compared to heat, self-administered acupressure and even pain medication. The study in BMS Complementary and Alternative Medicine did not differentiate between different modes of exercise for pain relief, but most of the research about exercise as a remedy for dysmenorrhea has centered around aerobic exercise. The benefits of exercise for relieving period pain are well-proven, such as research published in a 2018 issue of the Journal of Education and Health Promotion. In that study, 70 students who lived in the dorms of Mashhad University of Medical Sciences and reported primary dysmenorrhea were split into two groups: the intervention group, in which members did aerobic exercise three times a week for 30 minutes each time, and the control group, in which the members did not exercise. By the end of the eight-week study period, the intervention group — the women who had exercised — reported dramatically decreased pain levels compared to the control group. With that said, nobody is entirely sure why aerobic exercise is so helpful for treating menstrual pain. 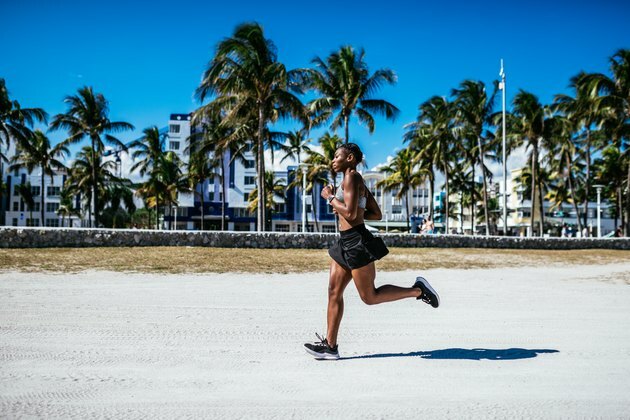 In a February 2019 article published in the journal Medical Hypotheses, researchers suggested that perhaps the aerobic exercise affects your body's hormonal balance and your immune response to inflammation. Aerobic exercise is also known to provide a number of less tangible benefits, such as boosting your energy and your mood, that might help remedy other symptoms of premenstrual syndrome. Sometimes it's just plain satisfying to know that even if your body doesn't feel so great for that first day or two, you crushed your workout anyway. Not up to crushing your workout? No problem. You can still enjoy the dysmenorrhea-busting benefits of a workout even if you're not going full speed — just modify your routine to a level that feels good to you. There isn't as much scientific research about resistance training during your period as there is about aerobic exercise. However, the information that is available suggests that if you feel like a sort of beast on your period, it isn't your imagination. For example, in a 2016 dissertation for Sweden's Umeå University, doctoral student Lisbeth Wikström-Frisén showed that women had greater gains from strength training during the first two weeks of their menstrual cycle than from training in the last two weeks of their cycle. Technically, each new menstrual cycle starts on day one of your period, so that two-week "beast mode" window includes active menstruation. Most yoga teachers agree that it's fine to do yoga during your period, although some might recommend doing a gentler, inward-focused yin style during this time. Making the switch or not is up to you. There is one area where you're more likely to see some contention. Depending on what sort of training your yoga teacher has had, she might tell you that it's perfectly OK to do inversions during your period, or she might recommend against it because it's believed to disturb your natural energetic flow. Yoga expert Heidi Kristoffer and OB-GYN Sherry Ross, both interviewed for an article in Shape magazine, agree that the prohibition against inverting while menstruating is simply a yoga tradition, not a medical concern. You're free to decide for yourself whether you and Aunt Flo are going upside down or not. Once you've been through the menstrual-go-round a few times, you'll realize that, even for the same person, one period can be different from another — and sometimes it's very different. That first day can be a particular mystery because it'll often set the tone for what's to come. So on the practical side of things, if you're working out on the first day of your period and not regular enough to be sure what you can expect from your uterine lining that day, it never hurts to take the appropriate precautions. This could mean wearing a menstrual pad, menstrual cup or even period underwear (which has built-in absorbent panels to absorb moisture and keep it away from your skin) as just-in-case protection or even as backup against a heavy flow. Period underwear is also a great backup for tampon or menstrual cup users who might be concerned about shifts in position causing leaks. If you're a tampon user who dislikes menstrual pads, period underwear is also a nice no-show solution if you're worried about your period starting during your workout. As long as you know you're covered against leaks, one of the things you don't have to do is modify your workout routine, unless you choose to do so for your own comfort. You can most certainly do squats, lunges, handstands, splits and other exercises with the same range of motion while menstruating, just as you'd do them while not menstruating. Is period-induced breast soreness harshing your workout groove? Consider investing in a super-supportive sports bra to help keep the ladies under control until your symptoms subside. Shape: Is It Bad to Do Yoga Inversions on Your Period? Medical Hypotheses: Does Aerobic Exercise Induced-Analgesia Occur Through Hormone and Inflammatory Cytokine-Mediated Mechanisms in Primary Dysmenorrhea? What Exercise is Good During Your Period? Can Exercise Lower Period Days? Does Exercise Cause Lighter Periods? Can You Do Yoga During Your Period?